National Water Week takes place from 18-24 March, and it’s the perfect time to focus on doing your bit to conserve our precious water resources. Plan for a water-efficient garden by planting a garden of waterwise plants. Plectranthus fare best planted under trees or in other shady spots. They’re drought-tolerant once established, so plant in autumn to catch the winter rains. You can plant them in either garden beds or pots. For larger species, prune once a year and deadhead when required. Plant fynbos such as proteas, Ericas, pincushions, buchu and restios after the first rain. Sow veggies such as cabbage, cauliflower, carrots, onions, Swiss chard, spinach, celery, leeks, endives, parsnips, turnips and beetroot in preparation for hearty winter broths. Plant leafy herbs such as chives, sorrel, rocket, basil, dill, parsley and chicory. Sow or plant flowering seedlings such as poppies, stocks, linaria, nemesia, viola, calendula, snapdragons, cornflowers, foxgloves, lupins, dianthus, nasturtiums, asters, larkspurs and pansies. Stock up on general fertiliser, wait until the first rain and then give your entire garden a good feed. Chat to a garden expert at your nearest Stodels branch to recommend the right fertiliser for your garden. Deadhead roses and feed each plant with a handful of rose food to encourage another flush of flowers. Now is the perfect time to put down mulch – the soil is still warm and moist from summer temperatures. Conserve water by mulching around flower beds, trees and bushes. Apply mulch to new plantings that have germinated to deter weeds. Prune summer-flowering plants such as pelargoniums, lavender, abelia, weigela, daisies, heliotrope and salvia. Disguise eyesores like dead grass by planting rock gardens or adding gravel. Water during the early morning or late evening. 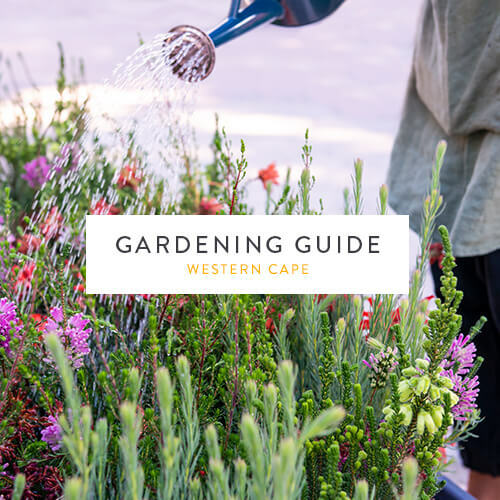 Watering plants during cooler times of the day will minimise evaporation and water wastage, and watering during the evening will give your plants all night to absorb the water before the sun dries them out. Switch to container gardening. With a smaller surface area for water loss and evaporation, container gardening is a growing trend and one of the best ways to save water in the garden. Collect grey water. Store greywater by using buckets or connect a grey water system to your washing machine and bath and shower outlets, and ensure collected water is used within 24 hours of storage. You should also take care to use eco-friendly products that are biodegradable to ensure the water isn’t harmful to your garden. The best technique is to alternate between greywater, rainwater, or municipal water so that there isn’t a build-up of residue. Create a rainwater harvesting system. Harvesting rainwater is a low-maintenance solution for saving water. If you have space, install a tank to catch rainwater. Depending on the requirements and installation, initial setup can be costly but will pay off in the long run. Other water-saving methods include using household containers, rain chains, rain barrels and ponds. Best of all, rainwater is better than tap water for gardening because it contains no chemicals and has the right pH level.